The fall hunting season is in full swing and client reports are starting to filter in from Newfoundland, Alaska, and Azerbaijan. 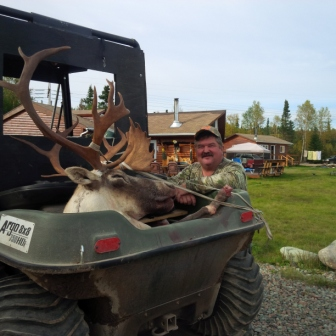 Our Woodland Caribou hunters continue to shoot excellent trophies while enjoying hunting by 8-wheel Argos from the lodge of Fred and Shirley Thorne. The Thornes receive 16 permits per year, but we were fully sold out for this year by the Conventions. We have only 7 openings remaining for 2014, so call now to book for 2014 or 2015. The price remains at only $6,450 for 2014 bookings, and you can add an Eastern Canada Moose for only $2,700. 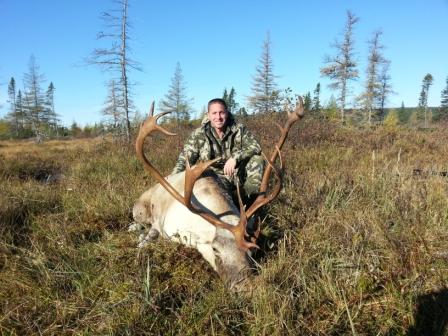 Justin Raggazine is closing in on the North American 29 after shooting a double shovel on the first day of his hunt. Naturally, he had great things to say about the area, the lodge, and the food (regarding which he didn't have much!). Mark Farnham ran into several days of bad weather (it can be rainy and windy in Newfoundland, and it was for Mark), but he managed to shoot a nice double shovel and make it back to the lodge after a hard day. 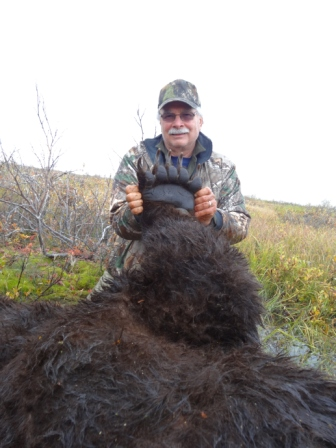 Mark also shot a representative Moose, as did his son, Derrick, who was an observer for the Caribou portion. 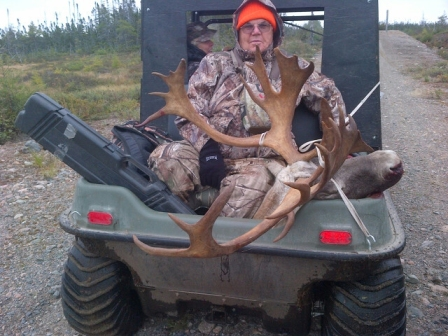 This is a great photo of Garth Frehner in the back of an Argo with a good bull (look at those bezes!). But this is not Garth's Caribou ... his wife, Jerri, shot it and then took the front seat of the Argo for the drive back to the lodge. We'll have a report and more photos from this hunting couple in our next Newsletter. 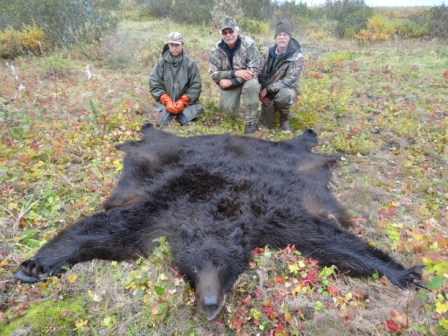 Ken Wilson just returned from his hunt for Brown Bear on the Alaska Peninsula with long-time outfitter, Brad Saalsaa. 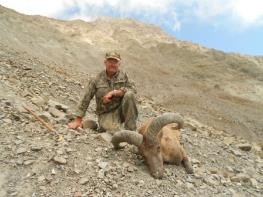 The day he shot his bear, he had two guides: Joel Boniek and Alan Hornberger. Ken flew into Port Heiden, where Brad met him and flew him to base camp and then to fly camp on September 30, the day before the start of the season. 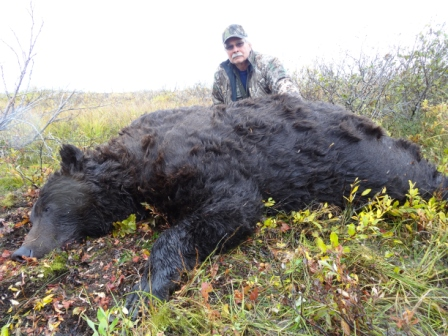 Ken saw 6 bears the first day and 3 the second day before shooting a good boar. Brad hunts out of Port Heiden every other fall and out of Cold Bay every other spring. The hunts for Eastern Tur take place in the summer and fall. 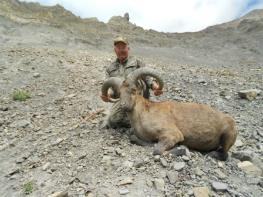 It's only a 5-day hunt with a very high success rate, but you must be able to ride horses and climb. Sam Berkey just got back from his hunt and reports he and his companion each shot good Tur (Sam on day two and his friend a day later). Sam reports that Mirbala had everything well-organized and that the two hunters in the next camp also shot good Tur.